Regice in game: 1,229 Who? Important notice! Pokemon Regice is a fictional character of humans. 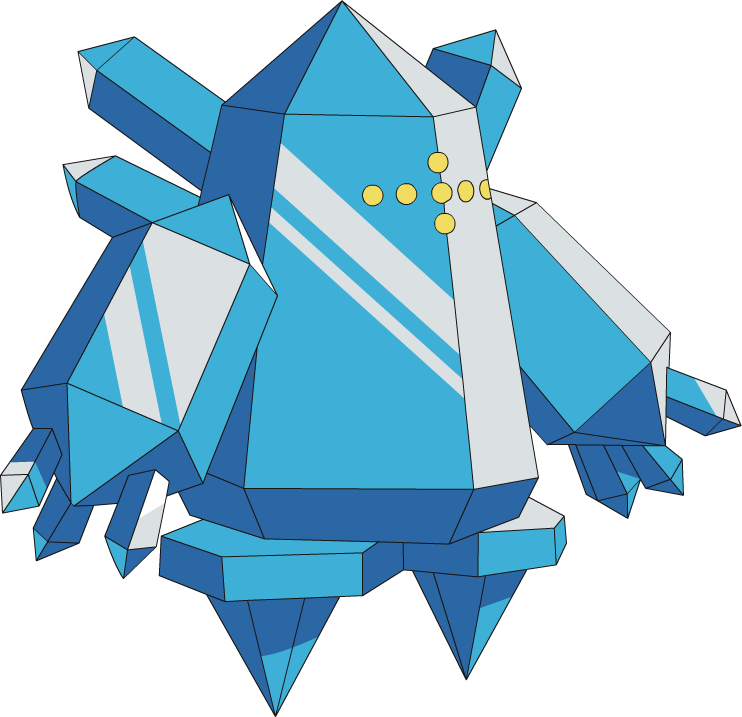 Regice is composed of Antarctic ice that resembles a crystal. Its face has an unusual pattern consisting of seven yellow dots in a "+" formation. It has four spikes on its back. Its legs are conical and it balances its entire body on those two points. There are three fingers on each of its cylindrical arms. 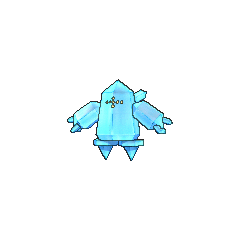 In the anime, Regice moves around by floating in the air. Regice cloaks itself in air that is -328 degrees Fahrenheit, and can survive submerged in molten lava and other extremely hot temperatures. Regice slept in a glacier for thousands of years. Regice made an appearance with Regirock and Registeel in the eighth Pokémon movie, Lucario and the Mystery of Mew, as one of the three guardians of The Tree of Beginning. It first tried to attack Ash, but was stopped by Lucario. In the end, it, together with Regirock and Registeel, turned away and went back to protect the Tree of Beginning. Ash's Pikachu battled and defeated Pyramid King Brandon's Regice in Pace - The Final Frontier!, thus making it only the second Legendary Pokémon to lose a battle in the entire anime series, after Noland's Articuno, which had earlier lost to Ash's Charizard. Regice made further appearances in the Diamond & Pearl series. Regice made a brief cameo along with the other members of its trio in the beginning of The Rise of Darkrai. Regice debuted near the end of the Ruby & Sapphire chapter, when Glacia was attempting to open the Island Cave. 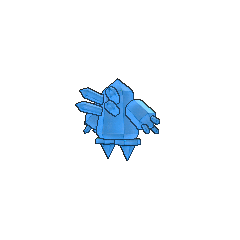 Together, Steven and Sapphire composed a team of four Beldum and Sapphire's Relicanth and Wailord, thus opening up the chamber containing Regice, as well as the other two titans, Regirock and Registeel. Regice used Superpower to stop Groudon and Kyogre from spreading destruction. After the battle, it and the other two titans—left weak and powerless—traveled to the mountains, where they were later caught by Brandon shortly before the opening ceremony of the Battle Frontier. 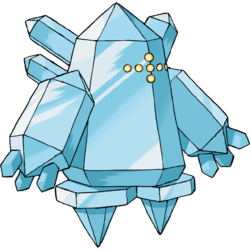 Regice, along with the other two Legendary titans, are seen under the possession of Candice. 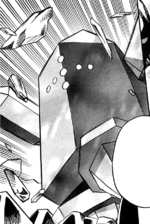 She uses them against Hareta to test his worthiness to challenge Regigigas. Event: Regice Freezes All Foes!, Regice Appears! Regice has the highest Special Defense of Legendary Pokémon, at 200. It has the highest Special Defense of all Ice types. It is also tied with Regirock for the highest single stat of any Legendary Pokémon with its 200-point Special Defense. Regirock's is its Defense stat. Regice may be based on the golems of Hebrew legend. The legends cast them as servants of higher powers and are said to have writing on their heads. When the writing is removed, the creature would be weakened.